Those of you with Scots' ancestry should appreciate hearing (though many of you know) that tomorrow, April 6th, is Tartan Day. Now many of you have probably not heard of this holiday-- probably because it's a very new holiday, designated by the Scottish Parliament. Woodrow Wilson said of the Scots, "Every line of strength in American history is a line coloured with Scottish blood." The contribution of the immigrant Scots upon North America is massive and these people have remained proud of their heritage. Numerous groups and societies throughout Canada and America have taken the anniversary of the Declaration of Arbroath (1320) as their national date to celebrate their Scottish roots. On December 19th 1991, in response to action initiated by the Clans & Scottish Societies of Canada, the Ontario Legislature passed a resolution proclaiming April 6th as Tartan Day, following the example of other Canadian provinces. America followed suit on March 20th 1998, when Senate Resolution 155 (S.Res. 155), proposed by US Senate Republican majority leader Trent Lott, was passed unanimously. Now, therefore, be it Resolved, That the Senate designates April 6 of each year as "National Tartan Day." I didnae ken aboot that. Not all contributors here are American; I'm a bit closer to "Auld Scotia" myself, near Manchester. I'll see if I can mark the occasion in some way, later on today. I'm part scottish, and supposively have lot's of relatives in scotland, both on my mother and fathers side. I've always wanted to see if I could locate them. But thats kinda hard, don't even know there names! The Declaration of Arbroath is the best known historical document in Scotland, famous for the line "It is not for honour nor riches, nor glory that we fight but for liberty alone, which no true man lays down except with his life." The Scots wrote this letter to the Pope because, six years after Bannockburn, Edward II refused to make peace with Scotland. They explained that Scotland had been an independent country before Edward I had tried to take it over and that Bruce was King, not just by birth and the Grace of God, but because he had successfully defended the kingdom. While the Pope replied to the letter, Edward did not. 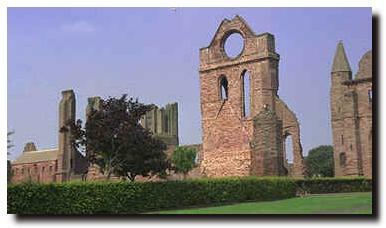 King William the Lion founded the Arbroath Abbey in 1178 in honour of the murdered St. Thomas, Archbishop of Canterbury. It was placed in the hands of the Tironensian order based in Kelso. King William granted his new Abbey independence from the mother house. He also showered it with endowments. These included the income from 24 parishes, a toft of land in every royal burgh, lands, fisheries, salt pans, ferries and of course Arbroath itself. The monks were permitted to set up a burgh, hold a market and to build a harbour. Even King John of England granted the Abbey the privilege of buying and selling goods anywhere in England, except the City of London, toll free. The function of Arbroath and every other Abbey was to provide an ordered way of life based on the Gospel's teachings under which the monks could serve God and sanctify their souls. The monks did not work outside the Abbey. Their chief function was to perform the Divine Office. Wha wad be a traitor knave? Wha wad fill a coward's grave? Freedom's sword would strongly draw? Let us do, or die. Many thanks for the information you provided. I find it fascinating!! I have often wondered when (and why) the term "Scotch" (used for a native of Scotland) changed to "Scot/Scots." Does anyone know? "Scotch" is an American term, obviously never used - as D'artagnan already said above - in Scotland and very rarely in England - see e.g. "Scotch-Irish heritage", "Scotch Gaelic" etc, all American terms. It's only used by those drinking Scots. here is what the OED(1971 edition) has to say about "Scotch" and "Scots". Scotch : "the three forms of the adj., Scotch, Scottish, Scots, are still current, with some difference in use, which, however is somewhat unsettled. Down to the middle of the 16th c. the only form used in southern English was Scottish; but in the dislect of Scotland (and of that in the north of England in the 14th and 15th c.) was Scottis (cf. Englis = English), subsequently contracted to Scots. As far as our quotations show, the contraction of Scottish into Scots is not recorded before 1570 (in the compound Scotchman), though the colloquial pronounciation which it represents may well be much older; instances of Scotch cap, Scotch jig occur in 1591-1599, but the adj. did not become common in literature until the second half of the 17th c. From that time until recently Scotch has been the prevailing form in England, though Scottish has always been the more formal synonym. ... [there follow the various descriptions for the use of the word "Scotch/Scottish"]. Scots : ' (Orig. Scottis, northern var. of Scottish) For the relation in use between this form and the two others see Scotch. ... [followed essentially by a repeat of the use of the word as under "Scotch"]. Well, there's not much more to add about this. I think it boils down to current fashion and practice. I was brought up in the 1950s, and would agree with Walter's contention that the word "Scotch" is not much used in Scotland. The words scots and scottish (as adjectives) are interchangeable, and custom dictates their use: for example, I would talk of "scots law", but "scottish touristry". There is not much distinction I can make about differences or shades of meaning here: I do not agree (respectfully) with HBG's suggestion that one is more formal than the other....but if anything, I would suggest the opposite from HBG's statement: the term "scots" is found in more highbrow texts, or in more traditional or older texts, than the more universal term "scottish". Too bad I'm a day late to be celebrating this but I'll try to remember for next year. I didn't see a mention that the first few Canadian Prime Ministers were Scotland-born and bred. I thought THAT was impressive. Prime Minister Sir John A. Macdonald -- born in Glasgow in 1815. Came to Canada in 1819. Was the first and third PM. Prime Minister Alexander McKenzie -- born 1822 in Perthshire. Came to Canada in 1842. Second PM. 5. The days commemorative of Christ's birth, passion, resurrection, ascension, and the sending down of the Holy Ghost should be kept in devout observance. These articles were passed by General Assembly at Perth on the 25th of August, 1618. It would not be until the 4th of August, 1621 before Parliament would fully ratify them. ...nothing remained but the touch of the sceptre, by which symbolical deed the proceedings of the parliament would be declared ratified. But in the meantime a heavy darkness had been gathering over the building; and just when the royal commissioner had risen from the throne and extended the sceptre to touch the acts, a vivid flash of lighting shone through the building; a second succeeded, and then a third, followed by peals of thunder that shook the house and carried dismay into every heart. To a generation that was seeking a sign, and that read the tokens of heavenly anger or approval in these sudden changes of the elements, this storm was the voice of God proclaiming his displeasure of the deed and demanding its revocation; but the prelatist party, after their fears had subsided, declared it a favourable omen, and that the same thunder and lightning which had confirmed the given of the old law on Mount Sinai, had been reawakened to attest the new laws which were now to be proclaimed. That day, which is Saturday, the 4th of August, was long after commemorated by the title of "Black Saturday." That's from the A History of the Scottish People as posted on the Royal Stuart website. During my first stay in Scotland in the 60's, exactly that was the first lesson, I got by everyone I met. i was merely quoting the OED, namely : "From that time until recently Scotch has been the prevailing form in England, though Scottish has always been the more formal synonym." my own knowledge of the english language is just good enough for daily use, but not much more. this morning i questioned a retired professor of english from kingston's Royal Milititary College (trained at oxford), who made a lot of throat-clearing noises and finally pronounced : "yes, i believe there is no clear-cut rule for the use of these words" - more noises (we were both in the pool - not sure if the noises were of a drowning , retired prof). hbg ... good old sir john a. is well known in kingston, since he lived here for quite some years; one of his houses in kingston is now a historical monument. he was buried kingston's (municipal) cataraqui cemetery. his love of "a wee drop" is part of the kingston lore. I did notice that Sir John A. was closely connected to Kingston, hamburger, but thanks for adding that site. He seemed to be a good leader for Canada. The verb "scotch" means put an end to decisively, and (archaic) wound without killing. The adverb "scot-free" means unharmed or unpunished. Funny how all these words "Scot, Scotch, Scots, and Scottish" just happens to be between scorpion and scoundrel! I've never heard of a Scotch fir...but there is a tree I like, a very handsome tree which grows well on sandy soils, called a Scots pine.